For some time now, I've been urging people to consider tangible investments rather than intangible investments. Fiat currency and all the investment portfolios in the world are subject to endless economic tweaking that could leave their real worth far less than you think. 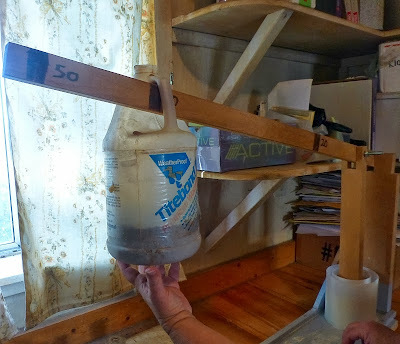 To that end, Don and I have always tried to think in terms of what would make our homestead more efficient and productive. Anything that fills these qualifications are, we feel, a worthwhile investment. This past week we had to have a vet come to dehorn a four-month-old calf, give her brucellosis and tuberculosis tests, and get all her shots up to date in order to sell her. As expected, it was a physical nightmare because let me tell you, a four-month-old calf has a LOT of kick in her. I was almost nauseous with dread as the vet visit approached, knowing what kind of rodeo I could expect. Then there was the follow-up vet visit to check the tuberculosis test, which necessitated catching her once again. In short, it was a lot of hard work. Hard, and potentially dangerous. A stray hoof could kick us in the gut or the head and do a fair bit of damage. And this was a calf, not a full-grown cow. Don and I are getting too old for this. That was our conclusion. Yet we are determined to remain in this homesteading lifestyle, so we had to come up with a way to continue that won't threaten us with physical injury. The solution? A squeeze chute. 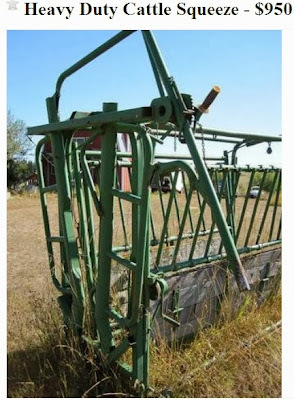 A squeeze chute is something we've needed for a long, long, long time... but the price has always put us off. Good squeeze chutes can run anywhere from $3000 to $7000, depending on how many bells and whistles they have. But after this past week's multiple rodeos, Don got on Craig's List and started searching out any possibilities. And oh my, he hit the jackpot. $950 is an awful lot of money for us, but we justified it two ways. One, if we're going to buy a big-ticket item, this is literally the only time of year we can do so, when we have a shot of income from the busy season for our woodcraft business. 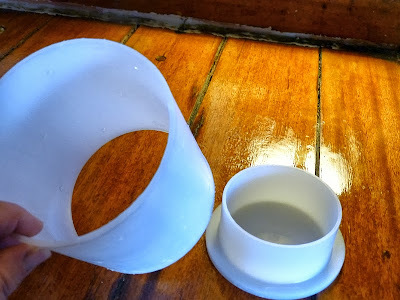 And two, the cost of a squeeze chute is ultimately cheaper than the cost of hospital bills from a concussion or bruised internal organs while trying to wrestle with a recalcitrant animal; or of additional vet costs for an injured animal. Besides, this chute is far less expensive than anything else we could find. Don drove out on Wednesday and inspected it from top to bottom and found it's in superb condition, with the exception of some rotted-out wooden floor boards (which are easy to replace). Don paid the man on the spot so no one else would snap up this bargain. So yesterday morning despite the pelting rain, we borrowed a neighbor's trailer and drove to the farm where the squeeze chute was located. It was about an hour's drive away, further into the mountains. Lovely location. The seller didn't have all his firewood in yet, but he had a good start. The seller was originally from Austria (he sounded exactly like Arnold Schwartzenager) and was retiring from raising beefalo. Beefalo are a cross between bisen and beef cattle, and apparently the meat is superb. However the animals are powerful and testy, far more wild than cattle, so needless to say a sturdy squeeze chute was essential. I figured if this chute could handle beefalo, it certainly can handle Dexters! 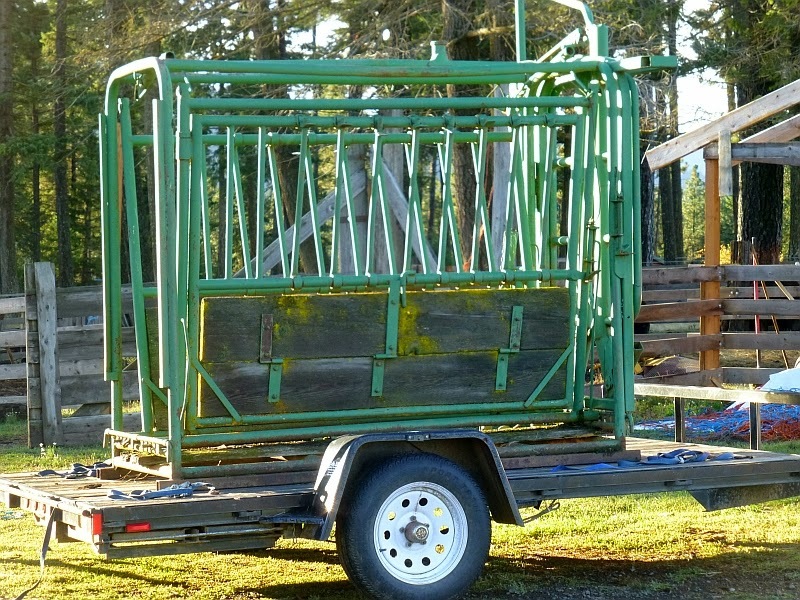 The seller already had the chute chained up to a track hoe, ready to load. ...then carefully nudged it until it was balanced in the middle. Then Don strapped it down for the trip home. 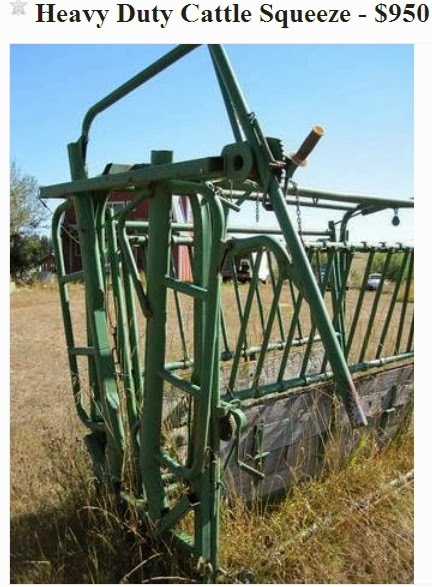 Before leaving, the seller showed us some other equipment he had for sale -- a sidebar mower, a plow blade, some balers, etc. There was an impressive yellow-jacket nest inside one of the balers. That's a solid nest down in the bottom of this roll of baling twine. Good thing the weather was chilly and the insects were sluggish, or I sure as heck wouldn't be photographing them this closely! The seller told us something about the sheer strength of the beefalo, and the damage they could do to intrastructure. 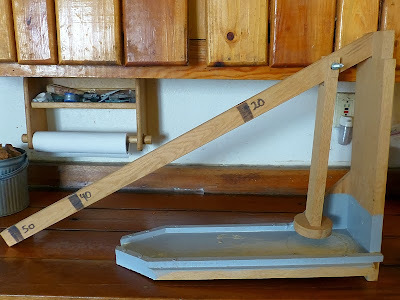 For example they easily bent this sturdy tube gate. ...are often reduced to metal matchsticks. I decided that no matter HOW fabulous the meat might be, I had no interest in raising something as powerful and half-wild as a beefalo. I like my Dexters and Jerseys. We drove home with our new treasure... pardon me, investment... and parked it until a neighbor can come over with his beefy tractor to unload it. We still have a lot to do before the squeeze chute is usable. We need to build a run to funnel the animals into it. 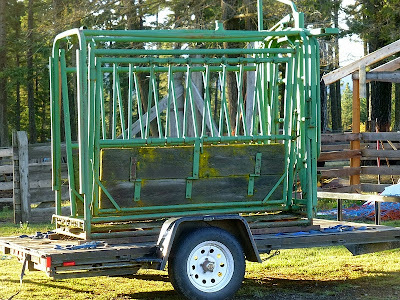 The run will be in a Y-shape, one branch of which will lead to the chute and the other of which will lead to a loading ramp for a livestock trailer. But the squeeze chute is the key to making life on our homestead a lot less dangerous and stressful, both for us and for the livestock. In short, we'd rather have $950 put into a squeeze chute, than $950 sitting in the bank where it's subject to inflation or even government seizure. Yes, tangible investments. Good idea. Here's my WND column for this weekend entitled Too Ignorant to Feed Ourselves. In your article TOO IGNORANT TO FEED OURSELVES I have to take issue with you. Not that anything you said was incorrect it's not. It just that you really give a false sense of hope to the lifestyle you prescribe. I know that which I speak as I live in a very suburban housing development and have raised chickens in my back yard and have had gardens all my life. My lot is a quarter archer (not very big) and I grow as many vegetables as I possibly can. The problem with this is we've eaten all them before the beginning of fall. This is not because we didn't conserve but that I just cannot grow enough in quantity to sustain for any great period of time. While I agree people do not know how to grow food and sustain themselves, I think the survivalist nuts give short shrift to the quantity of food needed to sustain for long periods of time. Not to mention, if a farmer doesn't have fuel to get his food to market, that would indicate a much broader problem beyond ones ability to sustain a stock pile of food and water. And another thing: Lots of people do (quietly) know how to grow their own food. If it ever really came down to it, they would teach those that do not know how. It is not so complicated that it could not be quickly learned. That's the short sightedness that exemplifies the "survival" community and the same short sightedness they accuse the folks on the other side of the coin of being. That being if all things remain the same what would be the outcome? The fact of the matter is Mrs, Lewis all things will not stay the same; people will adapt. Things will move more to a local level and as distribution changes we will survive. This survivalist crap has been going on since the 70's and it will keep going on till the end of this age. 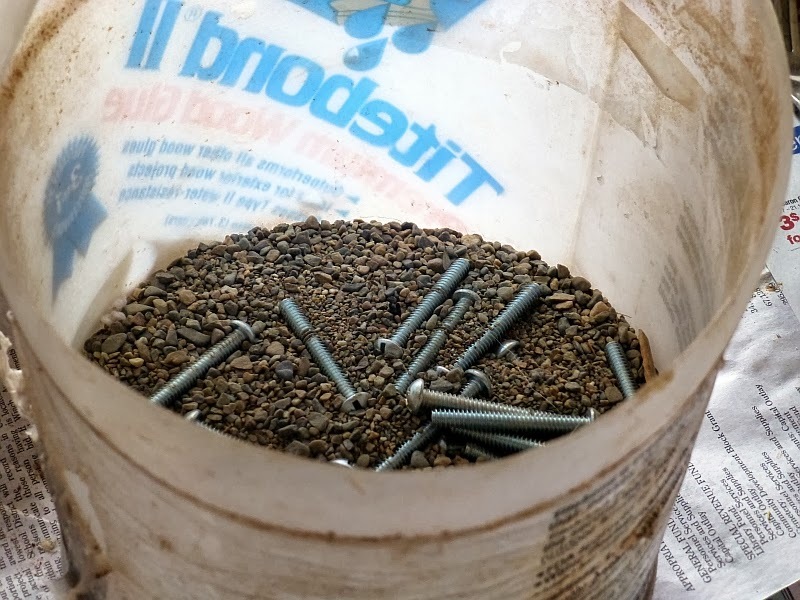 If I had started saving up food and supplies when these nuts first started gaining prominence, I would have a warehouse full of rotten food for an event that has never taken place. Is it possible all the things you say could happen/will happen? Of course it is but given the observable destruction of stars we have seen, it is also entirely possible the sun will not rise tomorrow as well. I am not holding my breath for either events. When it all gets boiled down to it you are an elitist snob survivalist because you call the rest of us stupid for not knowing how to raise a chicken or grow a potato. I don't know how to cure cancer but others do and I rely on them and their passion. Does that make me ignorant to the point I should attend medical school just in case I should contract the deadly illness? Well well well, guess who found the faucet? That's right, little Amy found mama's source of milk. We first suspected this when I was getting ready to milk Matilda one evening, and I heard "slurp slurp slurp" coming from the barn. Peeking around a corner, sure enough there was Amy, slurping away. I ran for the camera but of course by the time I got back into the barn, Amy was looking at me with wide-eyed innocence. "Who me? I'd NEVER be caught nursing!" In other words, Amy is draining Matilda dry. Well I can hardly object. It IS the way nature intended. Still, I must confess I was enjoying bottle-feeding Amy, she's gotten a beautiful start on being very tame, and I enjoy getting so much wonderful milk from Matilda. So now we're locking Amy into a pen at night so I can still get milk in the morning. And (ahem) I confess I'm still filling a small bottle with milk and feeding her first thing in the morning, just so she keeps seeing us in a beneficent light. Sorry I haven't been posting much but we're slammed with work. This is the last leg of our busy season and we're putting in long hours and dealing with a lot of stuff. Please stand by, I'll be back soon! On Sunday, the girls and I attended the third annual Sustainable Preparedness Expo in Spokane. ...which, we were forced to admit, held a lot of truth. The first thing we looked for at the expo was the booth for our friends Paratus Familia. It was impressively thronged, so we just stopped to say hello before walking around. I bumped into another friend -- in fact, the woman who made my bra holster (and yes, I was packing heat, now that I'm legal to do so in Washington) -- and together we attended a workshop called The Plan to Plant, given by a West Virginia agriculturalist who outlined what was necessary to grow ALL one's own food. Despite the fact that the acoustics were absolutely horrific in the large and echo-y exhibit hall, this seminar was jam-packed. Here's a portion of the audience. The large attendance at this, and every other, workshop underscored a major thing I notice whenever I attend one of these expos: people are HUNGRY for knowledge. They know something's wrong -- with our government, with the economy, with their vulnerability when it comes to empty grocery store shelves after any disruption -- and they want to learn more about how to help themselves. And let me tell you, every aisle was packed, every booth was thronged. There were a number of booths where I wanted to get some information, but I couldn't do much more than take a business card or brochure because the booth operators were far too busy talking with others. I was glad to see it. This is Dave Westbrook who runs a business called Country Living University, which teaches people how to start an information-based rural business. I heard him speak last year and was so impressed with his workshop that I approached him about interviewing for a Backwoods Home Magazine article. He agreed, but our respective schedules wouldn't permit us to get together (he lives several hours away). We touched base again at this expo and, since I have the go-ahead from the magazine for the article, I hope to interview him shortly. There was a third workshop I wanted to attend -- about putting sustainability into preparedness, which I think is an important component -- but the girls were absolutely dragging. The little party animals had been out until 11 pm the night before attending a birthday party for a friend and were practically asleep on their feet, so we left before the seminar. I really, really like the trend of putting on preparedness expos. More and more people are waking up to the fact that our economy is not as stable and trouble-free as they've been led to believe. It encourages me to see people actively seeking information on how to help themselves. With all the milk I'm getting from Matilda since little Amy was born, I'm back in full dairy mode and having the time of my life. This is a long post, so grab a cup of tea and follow me on this picture tutorial as I make cheddar cheese. I haven't been able to make cheese for several years since I haven't had enough milk, so I figured my cheesemaking skills would be a little rusty. Fortunately making cheese is sorta like riding a bicycle -- once you learn, it's hard to forget. That's not to say I would ever be without my trusty cheesemaking book. 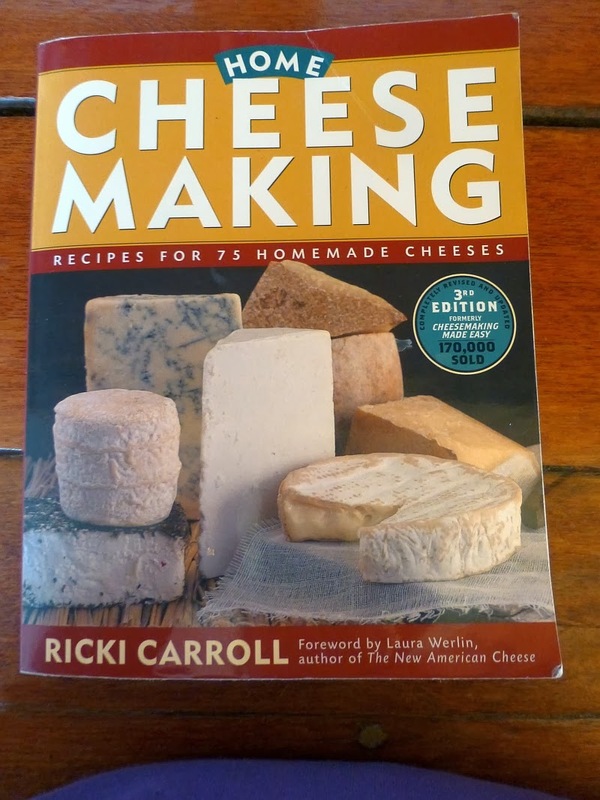 Since getting this book, my cheesemaking has become far more successful. It offers detailed step-by-step instructions that make the process much more understandable. 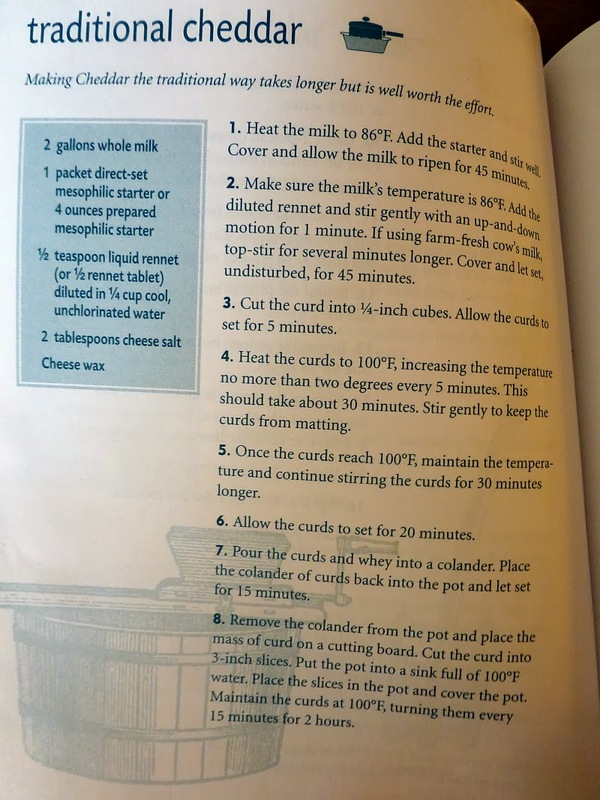 In this instance, I use the recipe for "Traditional Cheddar." Cheddar cheese requires a mesophilic culture. 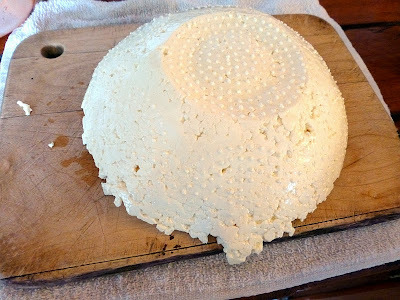 I had some cultured, but it was quite old -- dating back a few years to my last cheesemaking endeavors -- but I decided to risk using it anyway. 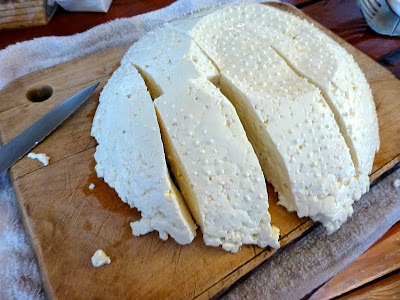 I've since ordered some fresh starter (mesophilic is for cheddar and other cheeses; thermophilic is for mozzarella and other cheeses; and fresh is for cottage cheese and other cheeses); however I haven't had a chance to culture it yet. 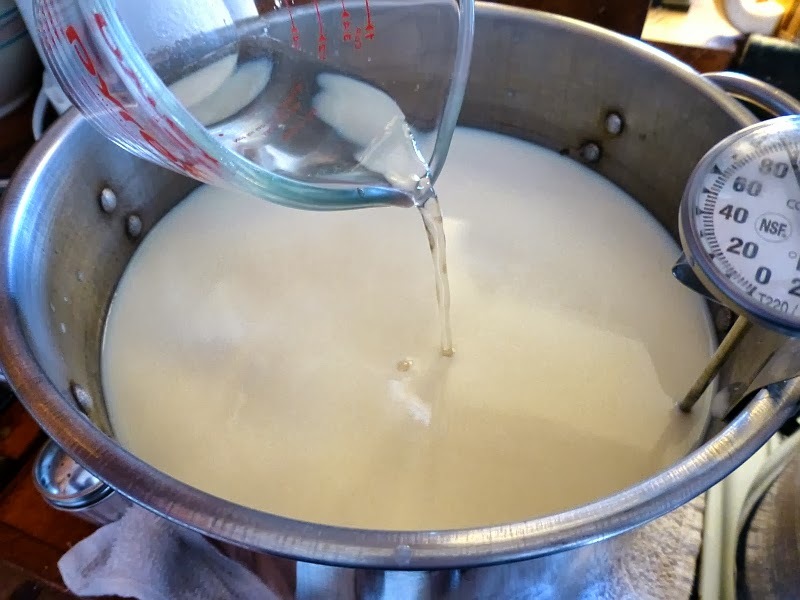 Cheesemaking isn't hard, but it requires patience and the whole day at home. It's a lot of "take this step and wait 45 minutes; then do that step and wait 75 minutes." Not hard, just lengthy. The biggest thing with making cheese is keeping an eye on the temperature. A thermometer is essential. 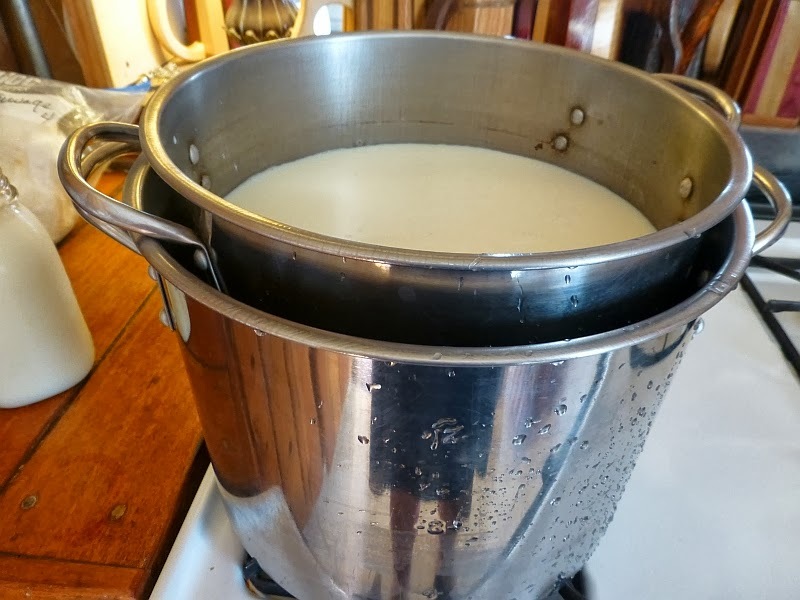 Anyway, I start with two gallons of whole milk. I nest my pots double-boiler style so nothing burns. 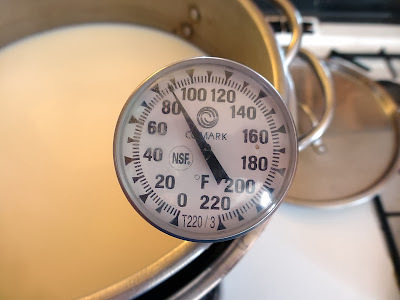 For the first step, the milk is brought to 86F. 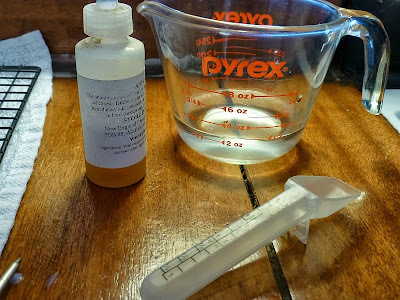 Then I added several cubes of mesophilic culture. Because they're older, they're all sorta mashed together and fuzzy with ice but, as I found out, this didn't seem to affect the viability of the culture. It worked just fine. 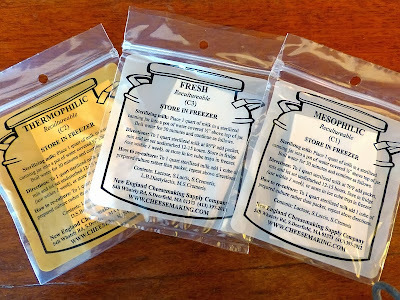 Stir and let the cubes melt. Once they're melted and the culture stirred in, let the milk ripen undisturbed for 45 minutes. Then I add rennet. 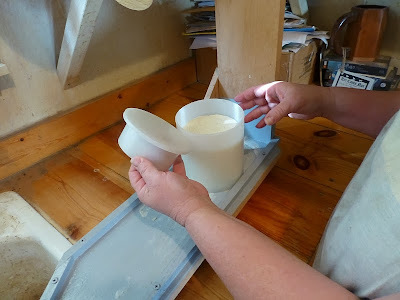 Rennet coagulates the milk and separates the solid (curd) from the liquid (whey). It has two sources, animal and vegetable. Animal rennet is derived from the stomach of a suckling calf who has never had solid food. Vegetable rennet can be derived from stinging nettles. 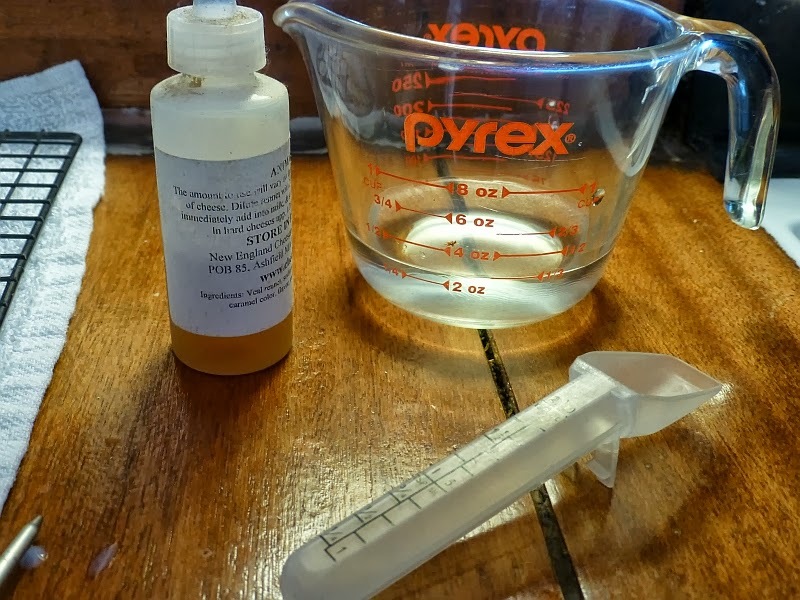 I use liquid animal rennet, half a teaspoon diluted in a quarter-cup of cool water. 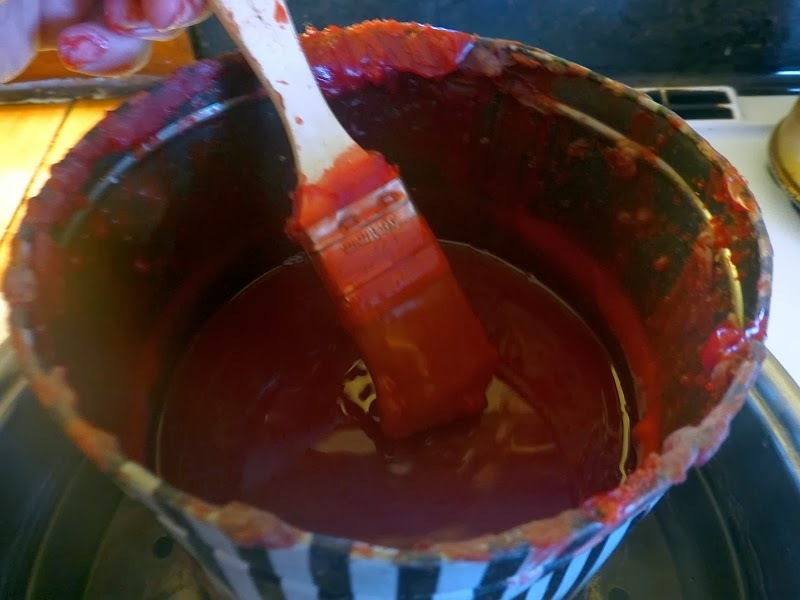 This is thoroughly mixed in, and then left alone for 45 minutes while it coagulates. 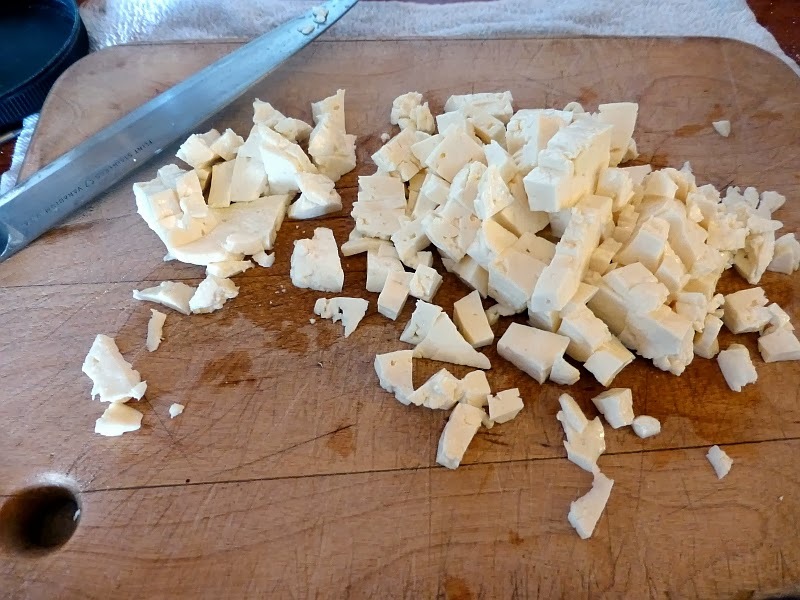 After this, the curds have to be cut. I like to use this long slim knife because it's long enough to go all the way to the bottom of the pot. ...then on a diagonal both directions. This breaks the curds up as evenly as possible in a deep pot. 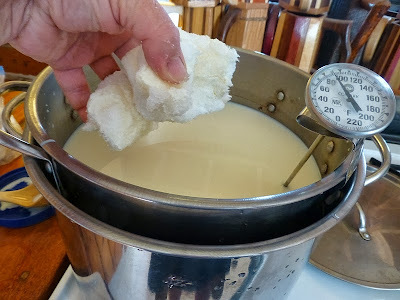 After the curds "rest" for five minutes, the next step is to gradually heat the curds to 100F over a period of half an hour. 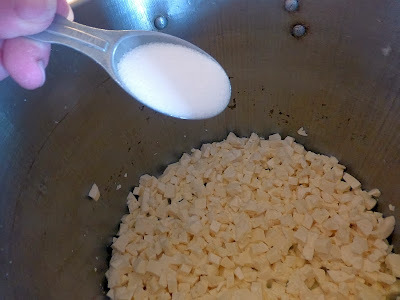 Took me awhile to get this step down, as I kept heating the curds too rapidly. 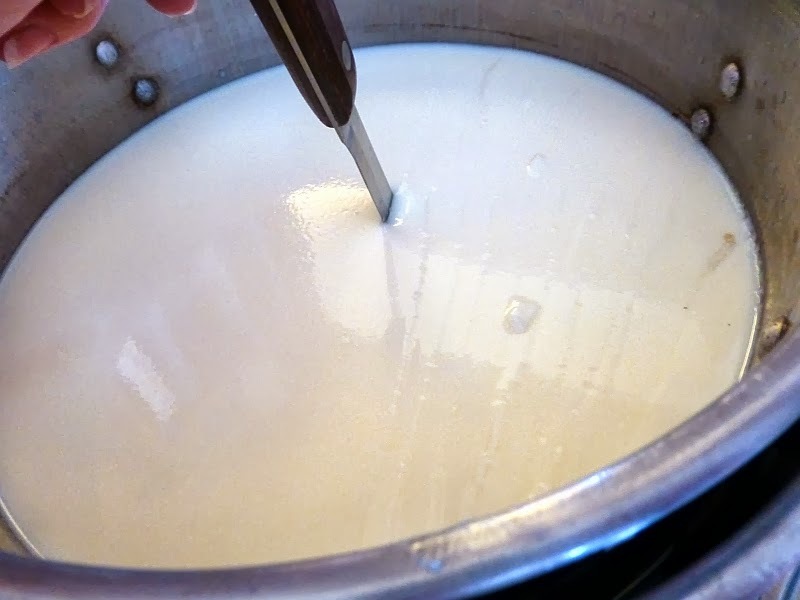 During this process, the curds get stirred every few minutes. When the curds reach 100F, maintain the temperature and stir once in awhile, for thirty minutes. 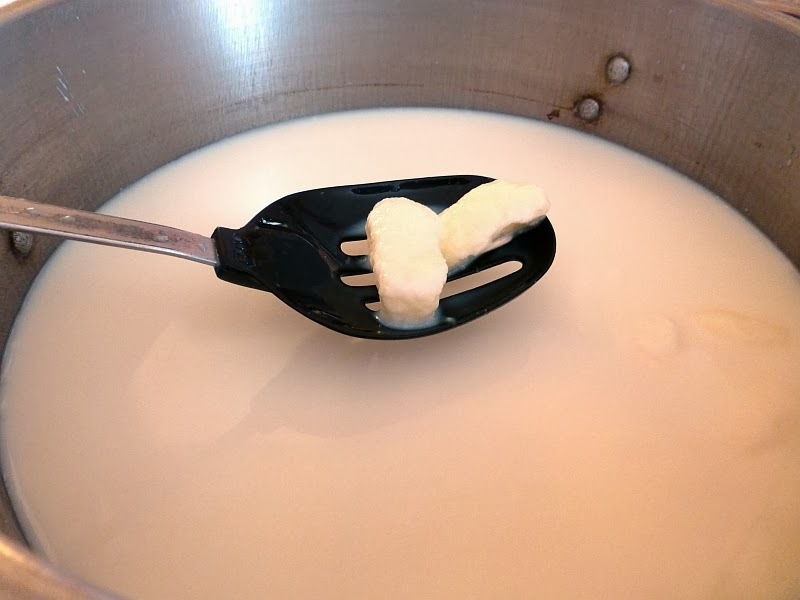 Then I leave the curds alone for 20 minutes to let them set. During this time, they will sink to the bottom of the pot. See? 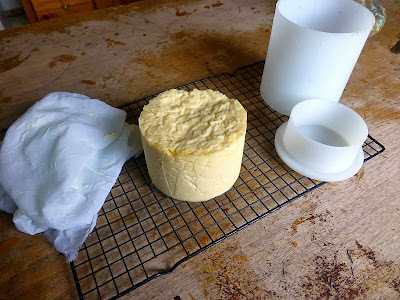 A waiting period here, a waiting period there... cheesemaking is a long process punctuated by a lot of time doing nothing. 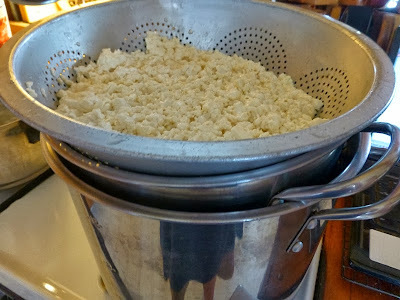 While the curds rested, it was time to get out the cheese press. 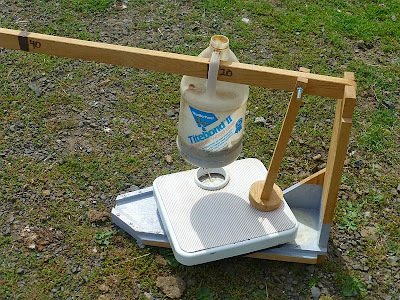 Long ago, we knew we couldn't afford one of those whiz-bang shiny metal cheese presses ($280!!! 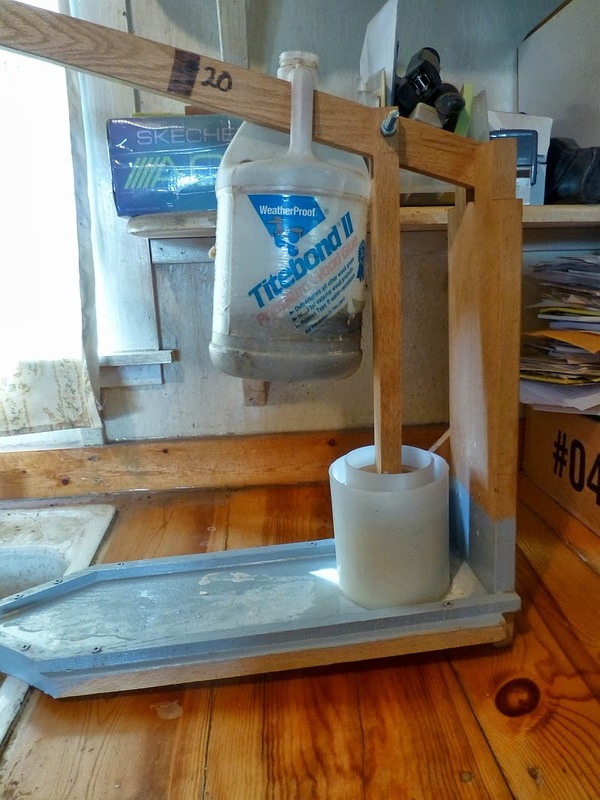 ), but when Don learned there were plans available (for $5) to make a homemade lever-arm cheese press, he announced "Plans? I don't need no stinkin' plans!" 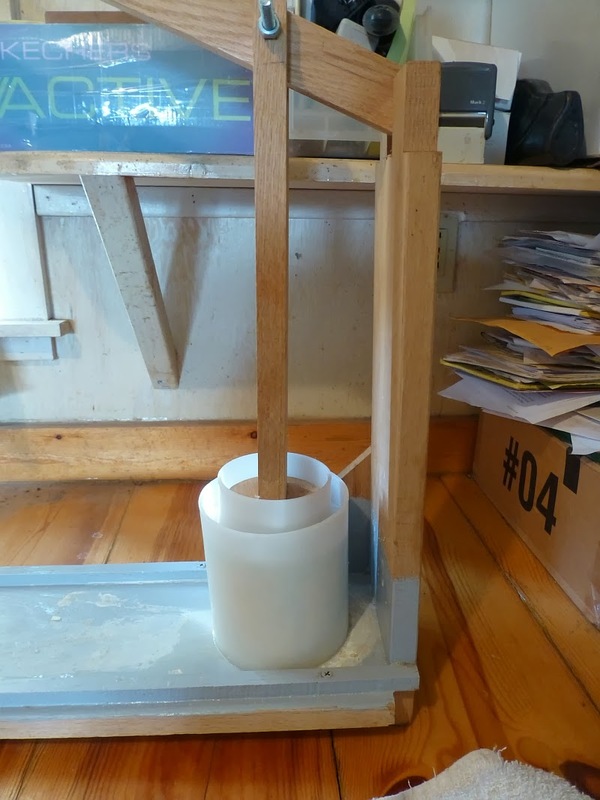 He disappeared into the shop and emerged a few hours later with a handmade lever-arm cheese press. Man, I love my woodworking husband! He marked the arm with the standard weights I use: 20, 40, and 50 pounds. It turned out I often use 10 lbs. too, so I "wing it" on the arm. The press has a bucket of sand/gravel/old nails used as a counter-weight. I needed to make sure the weight was still accurate. 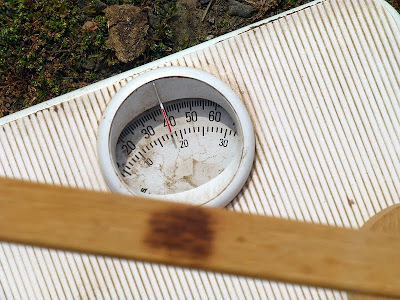 So I brought the press outside along with the bathroom scale to test it. First I tested it at 20 lbs, then at 40. 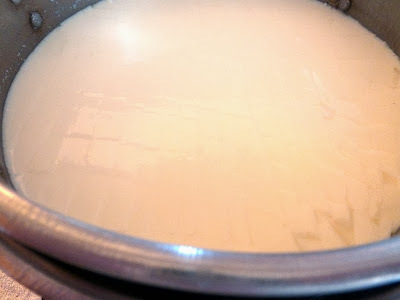 By this time the "resting" period for the curds was finished. Time to pour off the whey. Whey can be used to make ricotta, but I wasn't making ricotta this time so I just poured it down the drain. After this, I set the colander with the curds over the top pot of the double boiler arrangement, to drain for 15 minutes. I covered it with the lid to help keep the heat in. 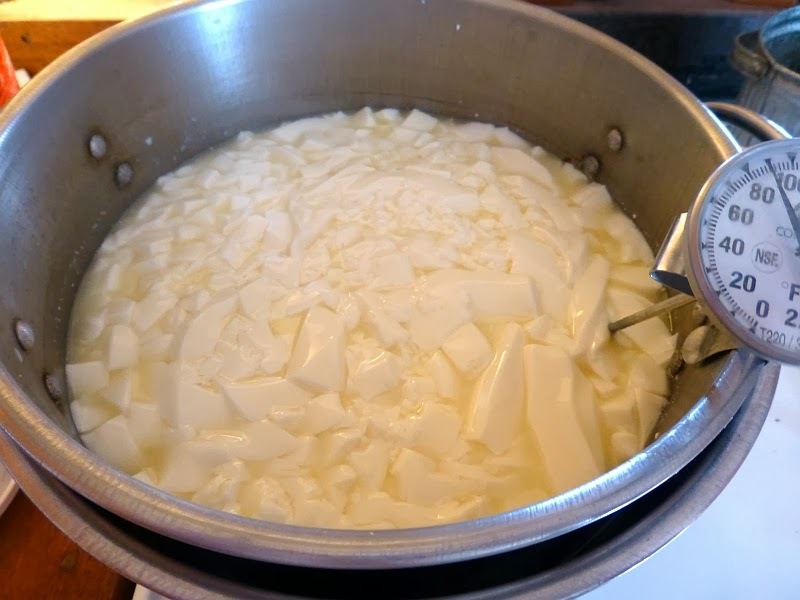 At the end of 15 minutes, I flip the curds onto a cutting board with a towel underneath. 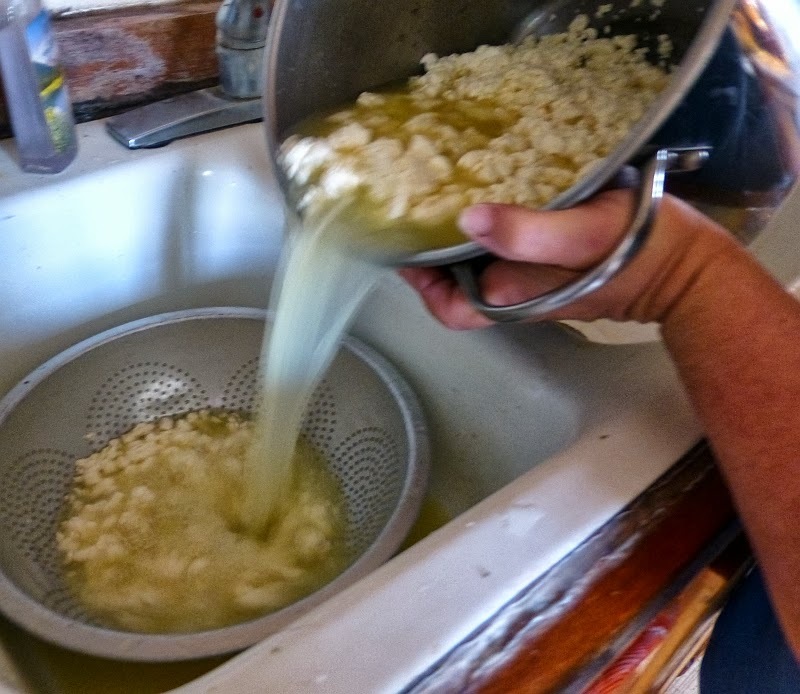 The curds are still pretty juicy at this stage, and the towel catches the drips. Then I slice the curds into big chunks, about three inches long. 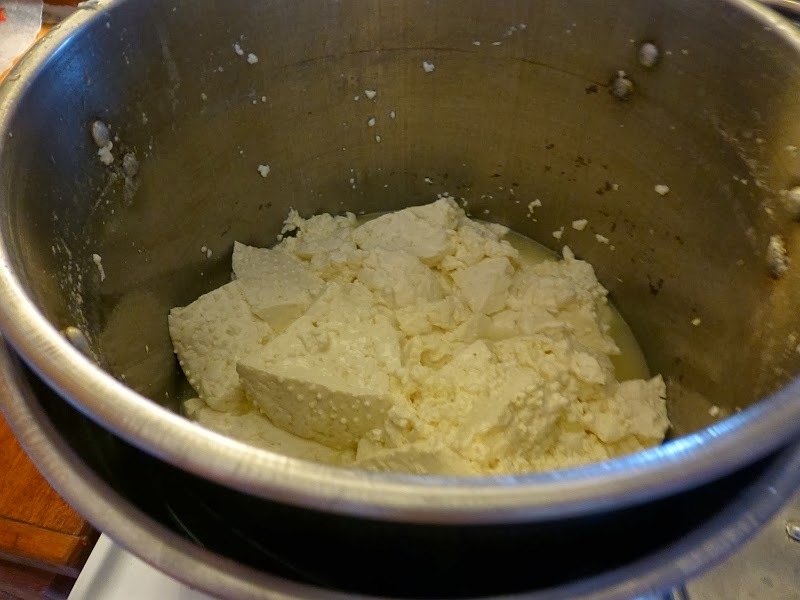 I drain the whey out of the top pot of the double boiler, and put the chunks of curds back into the pot. Then comes a two-hour interval where the curd pieces are maintained at 100F. The curds are flipped every 15 minutes. 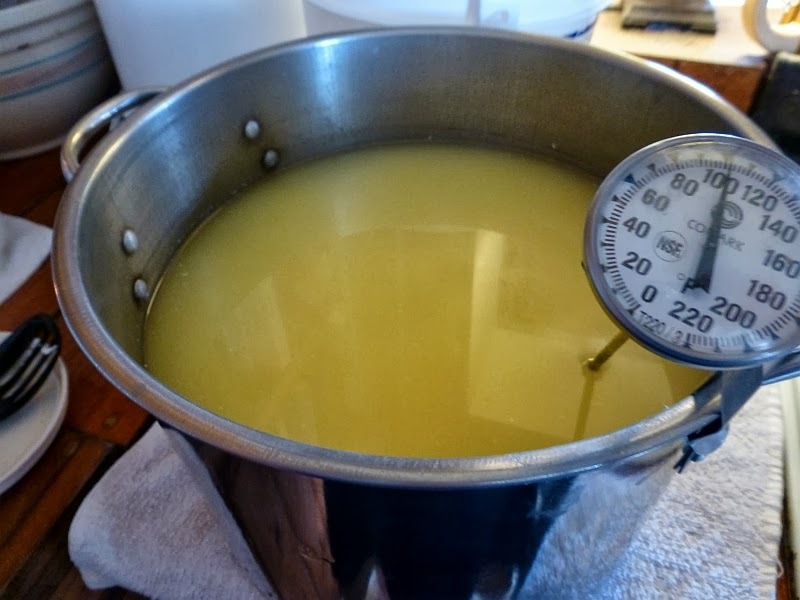 About every other "flip," I insert the thermometer and see how close the temperature is to 100F. 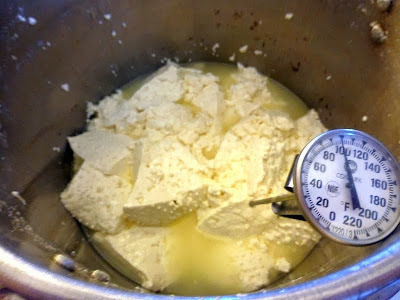 At this stage the curds can handle a little fudge factor, so I don't fret if it's a few degrees one way or the other. 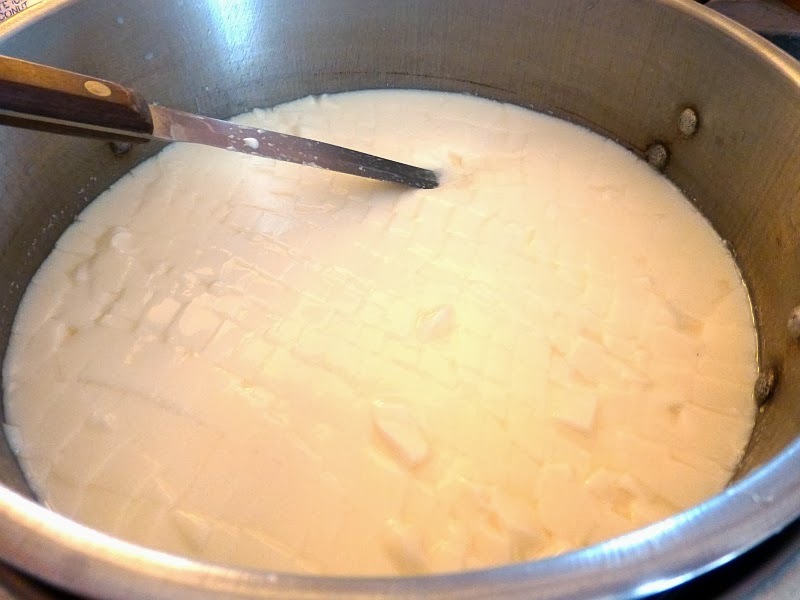 If the curds are too cool, I turn the gas on low for a minute or two. If the curds are too warm, I pull the top pot out of the double boiler and let it sit on a towel for awhile. 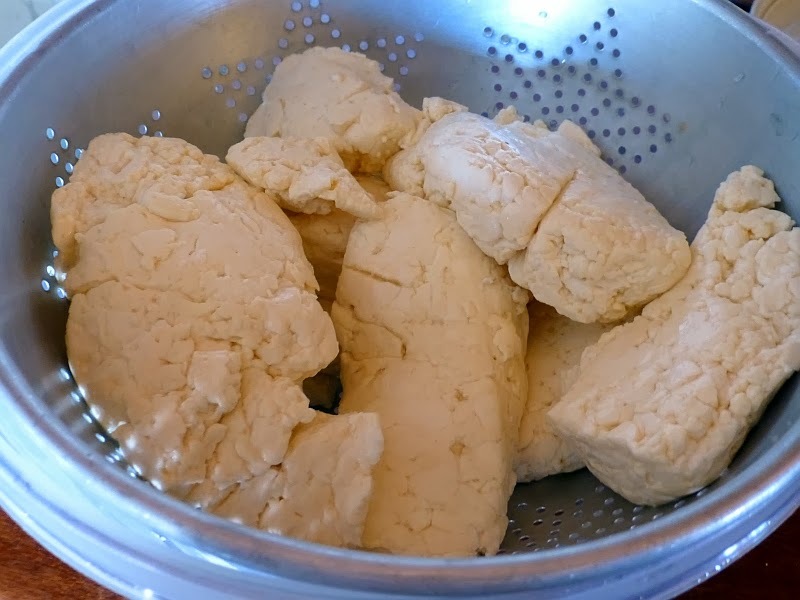 At the end of two hours, the curd pieces are tough and resemble boiled chicken breast meat. At this point, each piece needs to be diced. I cut lengthwise through each piece before cutting criss-cross. Put all the diced pieces back into the pot. 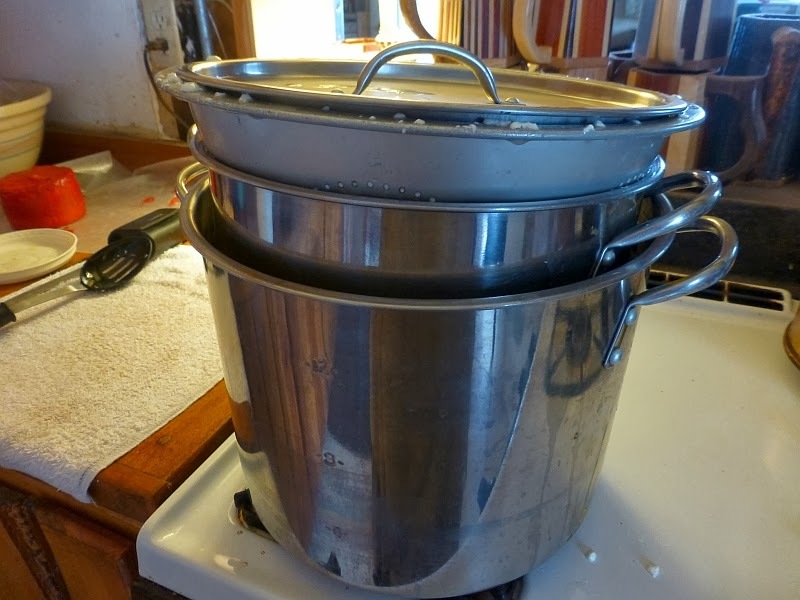 Cover and maintain the temperature at 100F for 30 minutes. Every ten minutes or so, I stir the pieces with my fingers -- not squeezing, just keeping the pieces from matting together. About halfway through this process, I add two tablespoons of cheese salt. 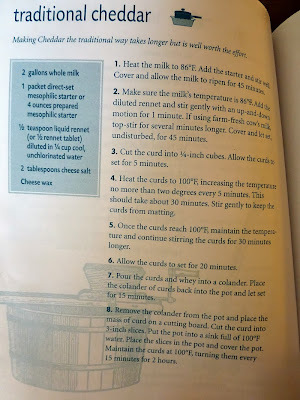 "Cheese salt" is merely non-iodized table salt (apparently iodine can kill the lactic bacteria during the aging process). At this point I get my form and follower ready. 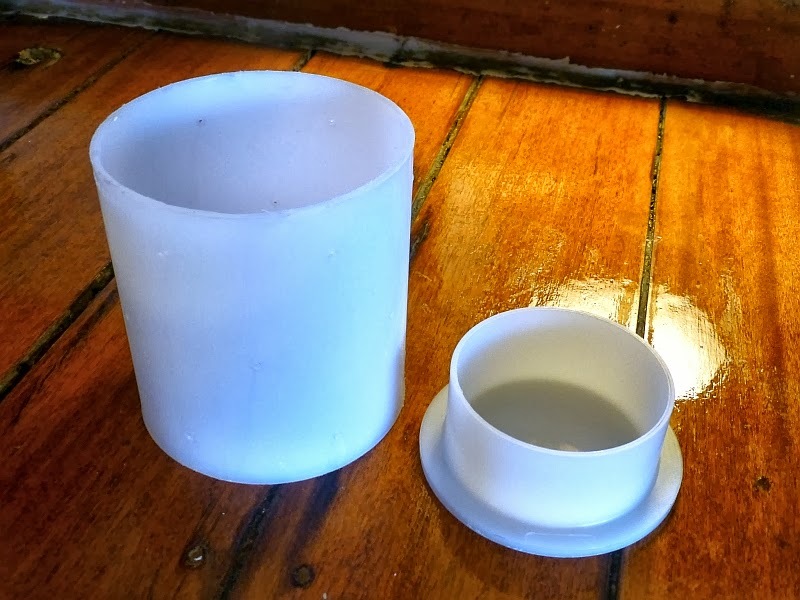 These are tough polypropylene molds. 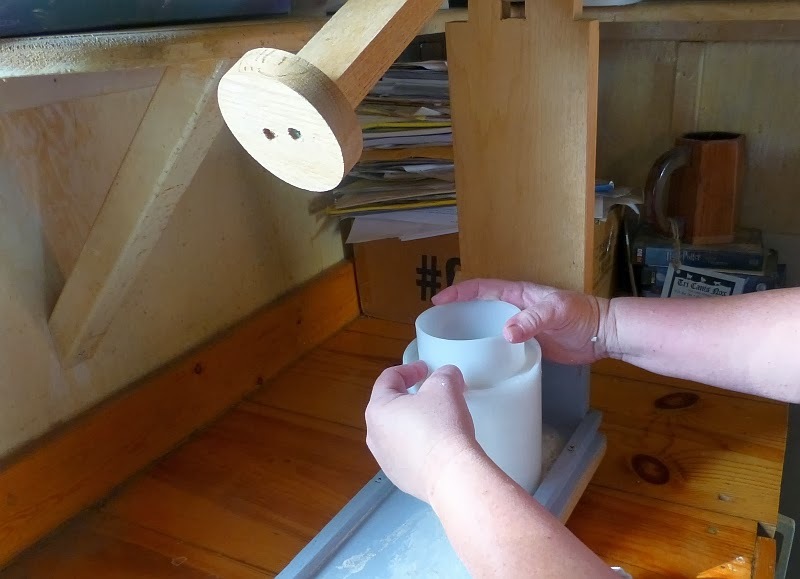 The form (the cylindrical piece) is perforated, and the follower fits snugly inside to press the cheese. 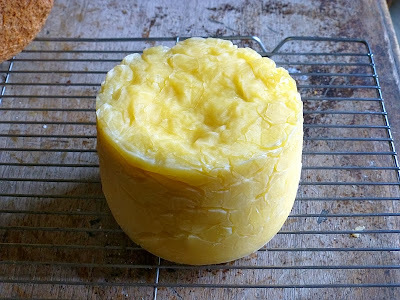 While I always advocate for homemade versions of things whenever possible, this is probably one of the few things I recommend buying new, if you plan to make a lot of cheese. It's not wildly expensive, and it will last forever. 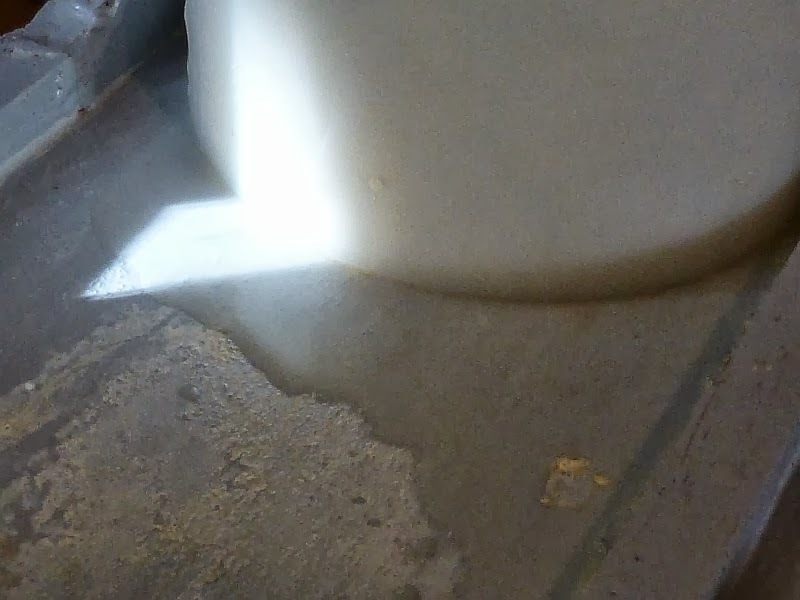 ...and line it with a thin piece of old clean sheeting. Some people swear by cheesecloth, but I hate the stuff (it tangles and is hard to re-use). Instead I keep large squares of old clean sheeting on hand for any number of uses, including dairy. Then the diced curd pieces get stuffed into the form. And I mean stuffed. Sometimes I have to press down to cram it all in, though in this batch it all fit easily. 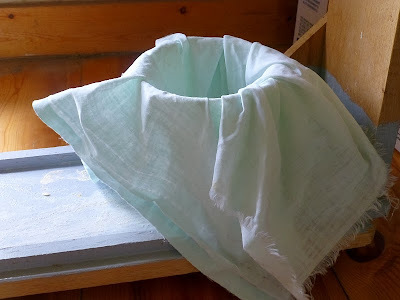 Then I fold the excess cloth over the top, kinda stuff it in place. 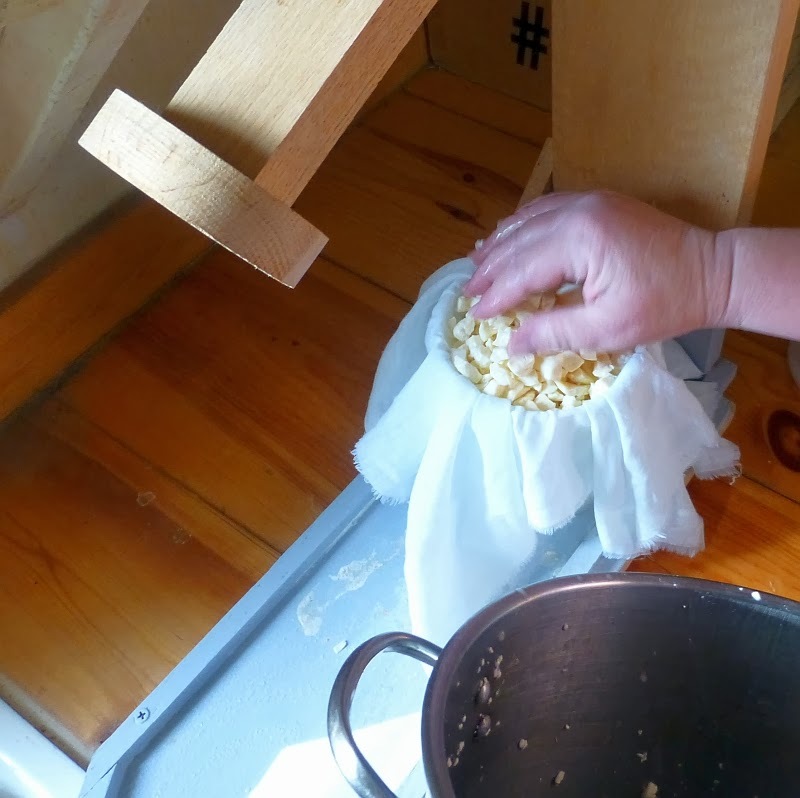 The idea is not to have any sheeting hanging over the edge. 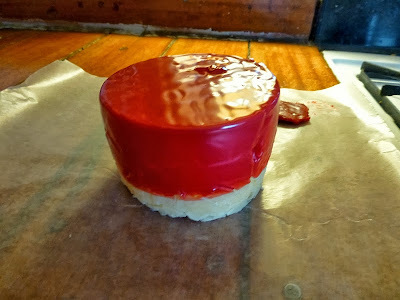 Makes for a lumpy top of the cheese, but oh well. 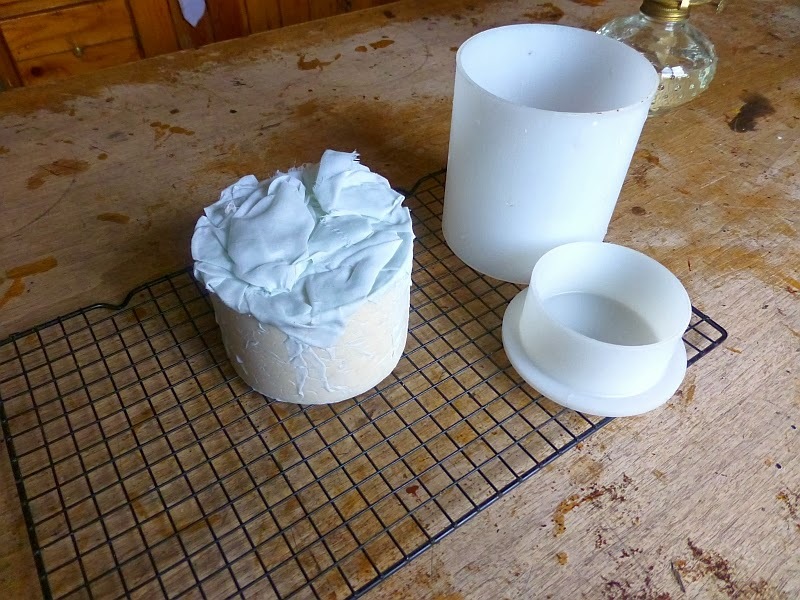 Then I fit the follower into the form, compressing both the curds and the wadded up sheeting beneath it. Then I swing down the arm of the press and fit the foot into the follower. 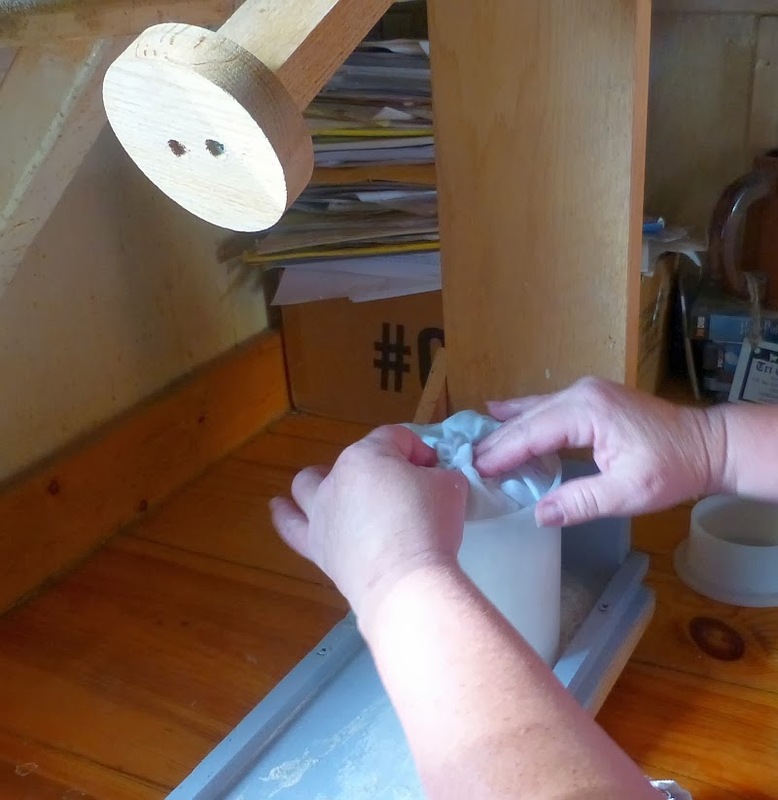 Then I slide the weight onto the arm. The 10-pound line isn't marked, but we know about where it is. A little "fudging" won't hurt the cheese at this point. The weight stays at 10 lbs. for 15 minutes. 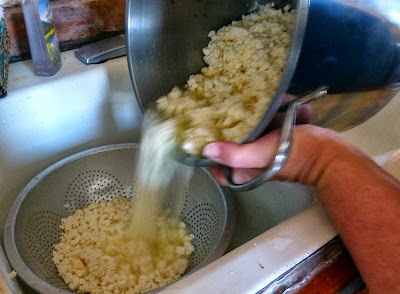 Right away, whey starts squeezing out of the curds. 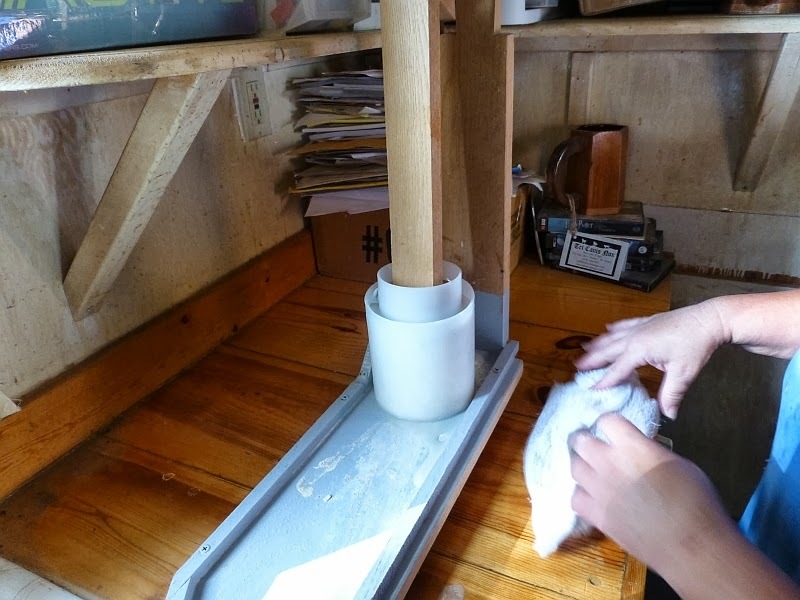 We always position the cheese press so the end tips over an old unused sink, to allow the whey to drain out. At the end of 15 minutes, I remove the weight and lift the arm, which also lifts the foot. I remove the follower and flip the cheese upside down. Then I reinsert the follower and the foot. 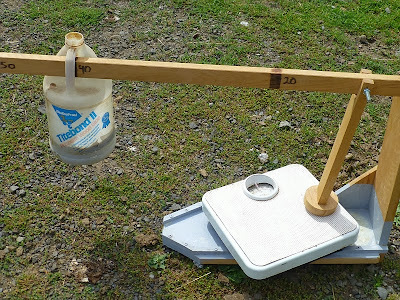 This time I place the weight at 40 lbs. The weight stays at 40 lbs. for twelve hours. Early the next morning, I flipped the cheese once again and set the weight at 50 lbs., where it stays for 24 hours. ...and push it out of the form. 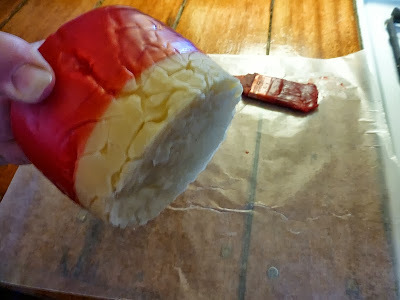 I carefully peel the cloth from the cheese (I can wash and re-use the cloth). Can you see why people say the moon resembles green cheese? 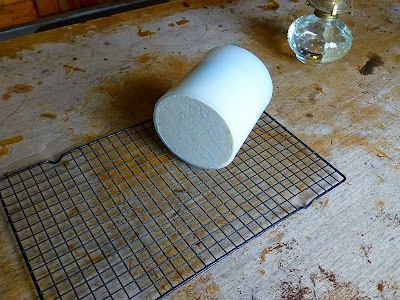 I keep the cheese on a rack for about three days in order to form a rind. 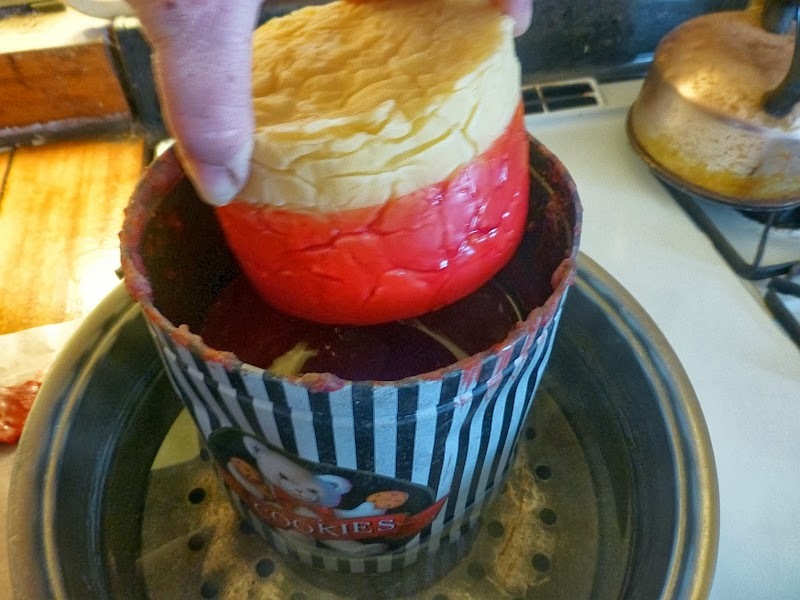 The rack allows air to get beneath the cheese to harden it on all sides. 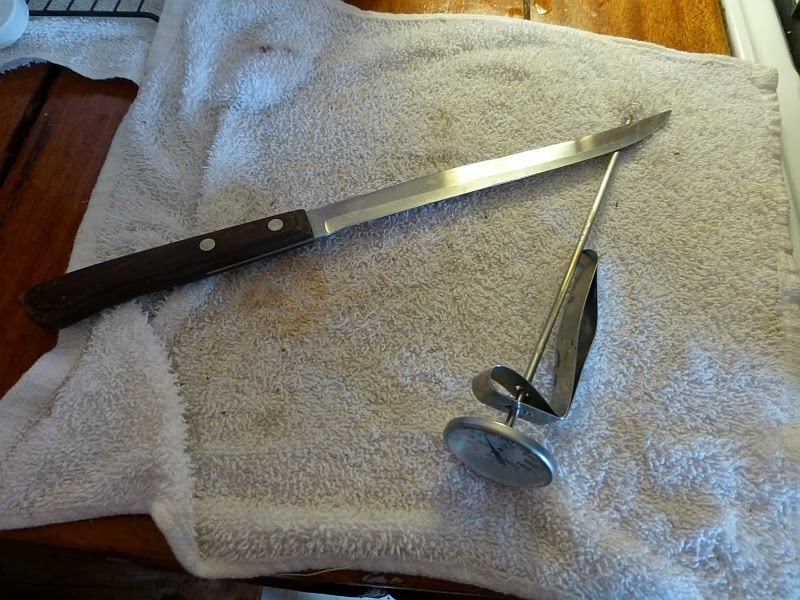 Then it's time to wax the cheese. 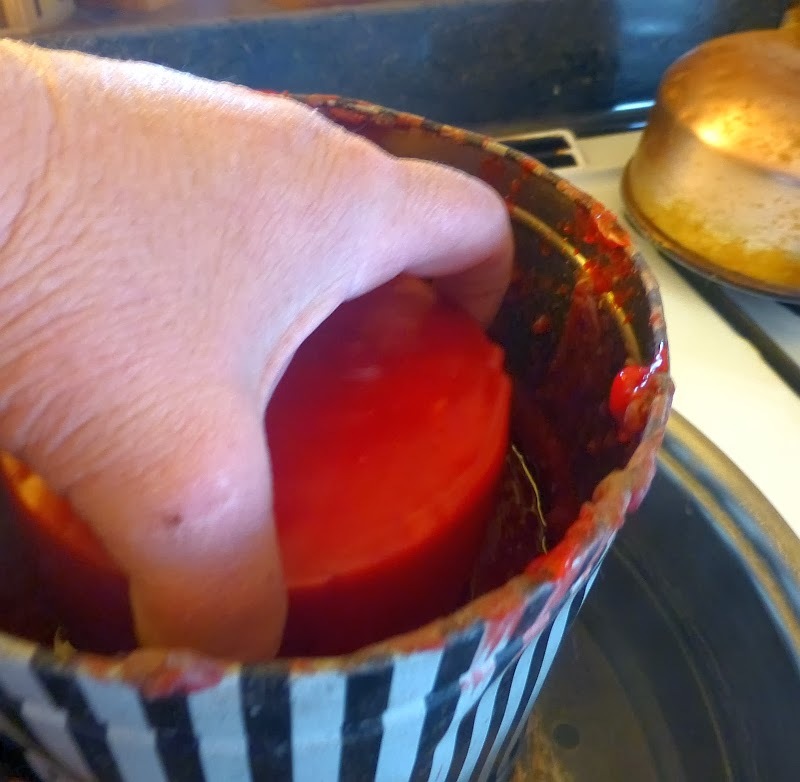 Cheese wax is different than paraffin wax. 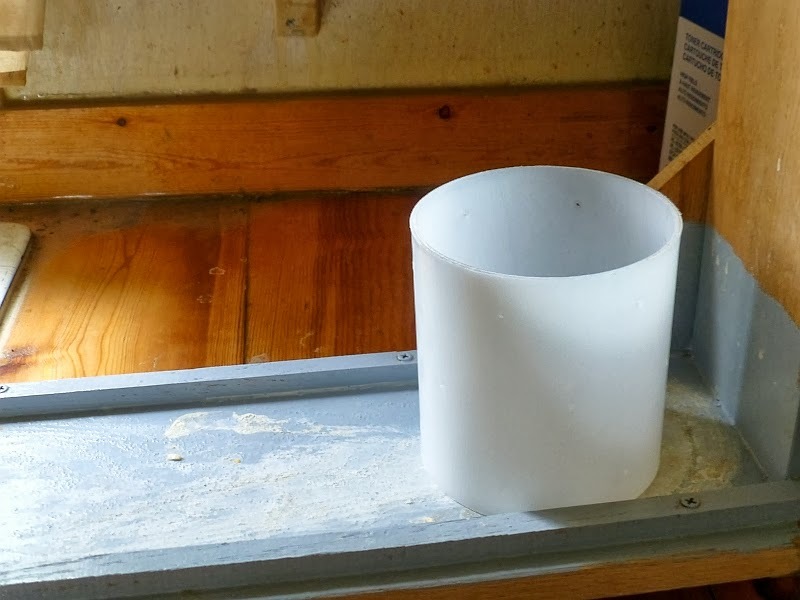 It's flexible and won't crack, and it can be cleaned and reused. 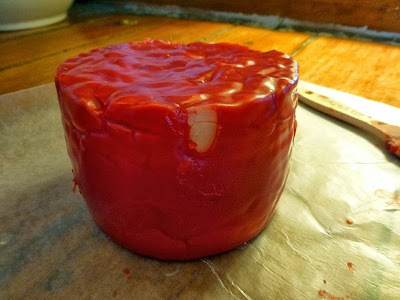 I got a five-pound block of red cheese wax a few years ago. 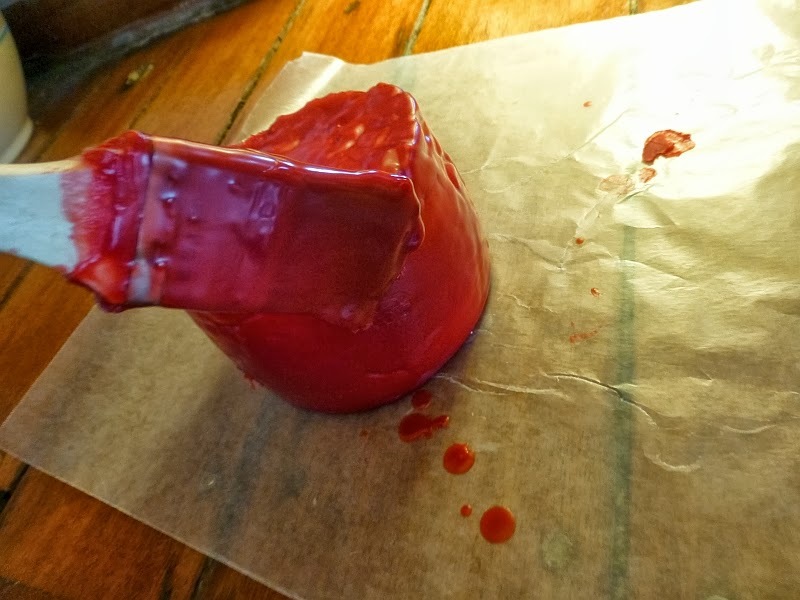 When it melted (which took hours! 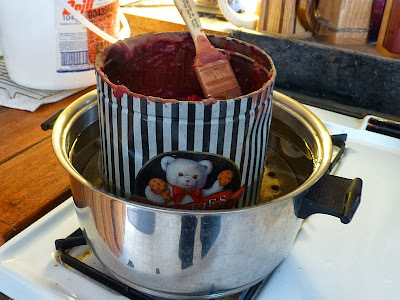 ), I poured it into this el cheapo tin I got at a thrift store. 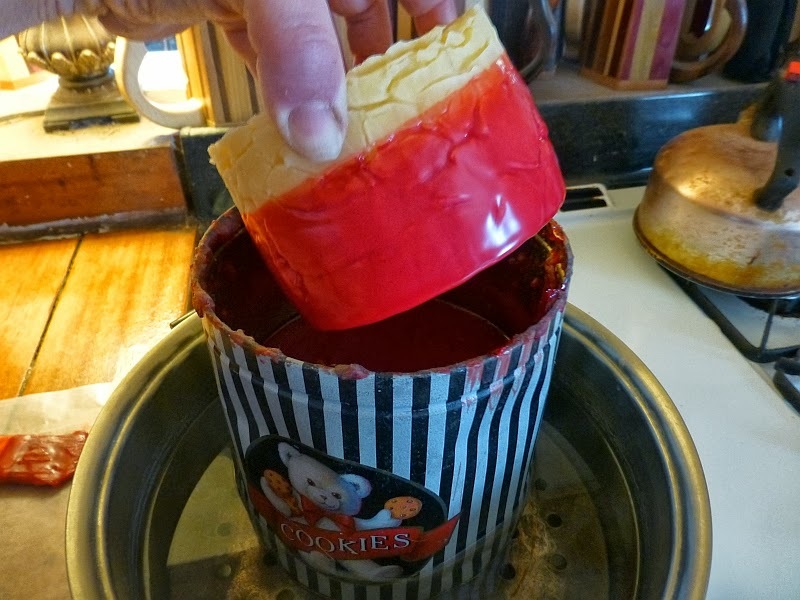 To wax cheese, I put the tin of hard wax in a pot of water with a rack on the bottom of the pot, and slowly melt the wax. It will take at least an hour to melt, so here's another opportunity for patience. In theory wax can catch fire, so I keep the heat low. Once the wax is melted, I lay a sheet of waxed paper next to the wax to catch the drips. Then I pick up the cheese and dip the bottom half once, twice, three times. 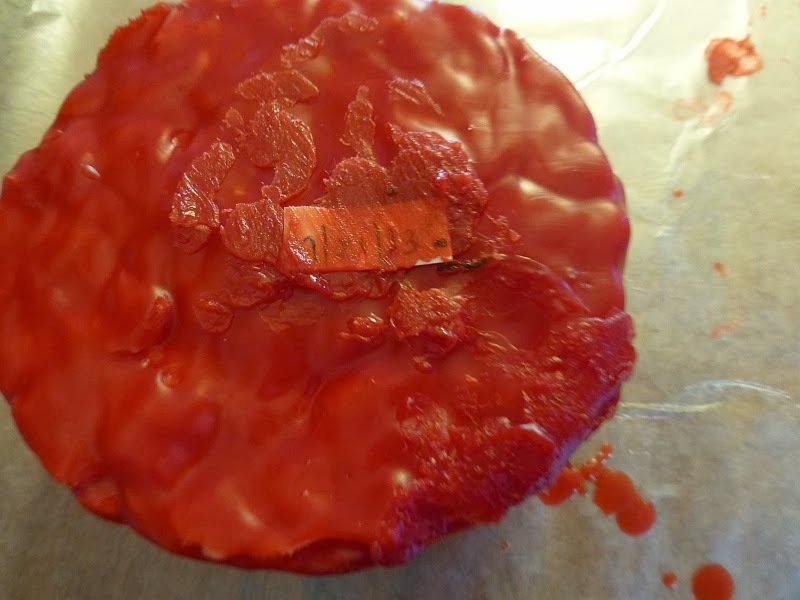 I let the wax cool for about ten seconds between dips. I lay the cheese on the waxed paper, wax side up, for about two or three minutes to cool. 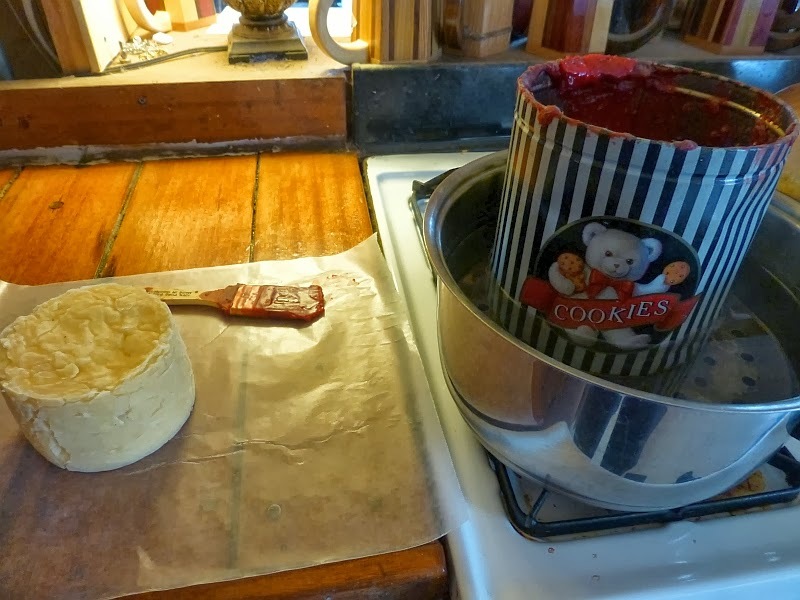 ...and dip the other half once, twice, three times. 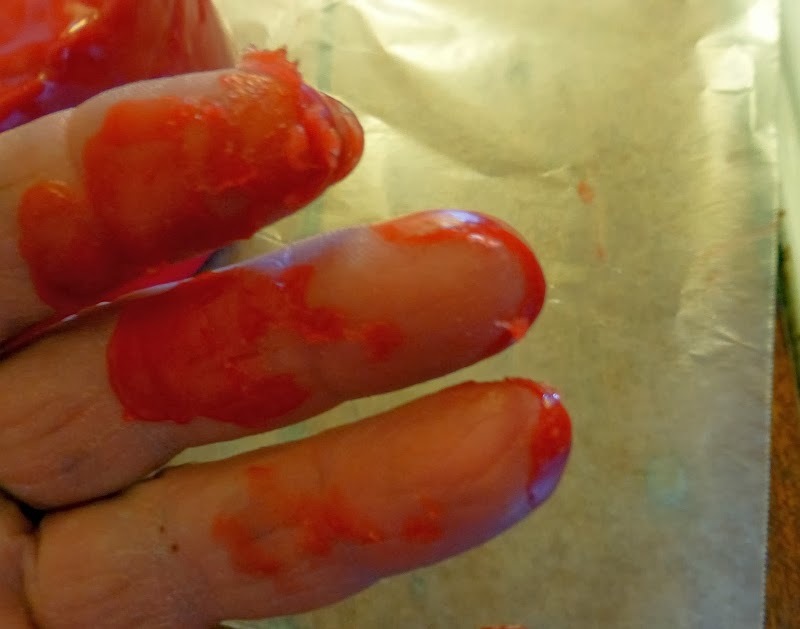 I managed to wax my fingers. I left a couple of bare spots, in this instance where my thumb was holding the cheese. That's where the paintbrush comes in. I just painted wax over the bare spot. ...and paint a thin coat of wax over it to secure it to the cheese. 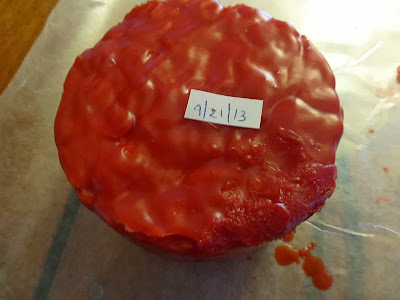 I'll age this cheese for about 2 1/2 months. The difficulty is finding a place to store it where it stays at a consistent 55F. I borrowed a neighbor's small dorm-size fridge and set it at its lowest setting, but it's far cooler than 55F, so right now I'm a bit stumped. Thoughts as to where I can find a 55F environment? UPDATE: Thanks to reader recommendations, shortly after posting this blog post I purchased a used wine cooler refrigerator. 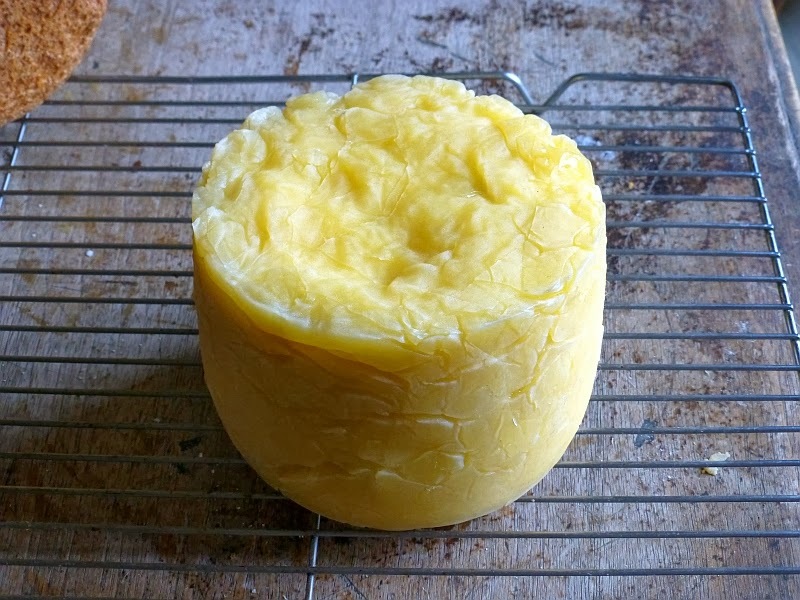 It's worked perfectly to maintain the cheese temperature during aging.